Egypt is no longer beholden to any hegemonic power, which has created room for the reconstruction of relations between Egypt and Iran that has been all but non-existent since the 1979 Islamic Revolution in Iran. Egypt and Iran are often referred to as the “bellwether states” of the Middle-East, because of their geopolitical positions and influence throughout the region. It was not apparent that when the newly-elected President of Egypt from the Muslim Brotherhood stepped into office, one of his first moves would be to reach out to the Islamic Republic. It came as a shock for many. What are the intentions of this Sunni organization, who filled the vacuum of power left after the Egyptian Arab Spring, for normalizing relations with Iran? The Muslim Brotherhood was founded in Cairo by Hassan al-Banna in 1928, who hoped to instill Shar’iah Law throughout the Islamic World. The Muslim Brotherhood has grappled with the question of whether to remain as purely a non-political organization working to change the hearts and minds of Muslims, or whether to delve into politics. This led to many splinters in the organization, but ultimately the masses consented that the power lies in politics which is why Mohamed Morsi, an Egyptian Muslim Brotherhood Leader, now occupies the position of President. The developing relations between Egypt and Iran are unprecedented. But it’s important to understand why these two countries are so interested in rapprochement. Firstly, Iran has for a long time sought to appeal to the “Arab Street”. Both the Supreme Leaders, Khomeini and Khamanei have seen the interests of the Arab World and Iran as being aligned: Resisting western imperialism, struggling for Palestinian statehood, and creating Islamic governance throughout the region. Egypt on the other-hand is fishing for new friends, after a long history of being colonized by the British, and controlled by the Americans and Israelis. The Islamic Republic of Iran for the Muslim Brotherhood-dominated government, represents what they want Egypt to look like. While many of the first leaders of the Islamic Revolution sought to “export” the revolution, the Egyptian Muslim Brotherhood would very much like to import it. This was evident in some of the very first actions Morsi took as President, which Ahmadinejad viewed as being in Iran’s favor. Mainly, that of opening the Rafah Crossing between Egypt and the Gaza Strip, allowing Iranian warships through the Suez Canal, and upgrading Iran-Egypt relations to the ambassadorial level. That was just the beginning. Since then, flights have been opened from Cairo and Tehran, and Egyptian and Iranian politicians travel frequently between the two countries, which for over three decades was rare. Iranian President Ahmadinejad for the first time since the 1979 Revolution, flew to Cairo to meet the newly-elected Egyptian President, and to signal Iranian interest in rekindling relations. However, this visit also indicated that while the Morsi government is interested in re-establishing ties with the Iranian government, the Egyptian people are not. Ahmadinejad was both greeted in Cairo with kisses from the government, and reprimands from its people . His support for the brutal dictator Bashar al-Assad in Syria and Hizbullah in Lebanon for the Egyptian people are irreconcilable. He was scolded on interfering with Gulf Affairs by Islamic Scholar Sheikh Ahmed al-Tayeb during his visit to the Al-Azhar Mosque, and met with flying shoes by protesters. Syria is a major point of contention between the two states, where Morsi has outspokenly called for Assad to step down, whereas Ahmadinejad is helping to prop him up. Any future relations between Egypt and Iran will depend on whether or not the two Presidents can put aside their differences regarding Syrian leadership–Or, will need to wait until after an inevitable fall of Assad. The financial aid from both the United States and Saudi Arabia–Two of Iran’s biggest foes will also be a huge impediment on any official alliance between Egypt and Iran from forming. After the “warm gestures” by Morsi and Ahmadinejad by exchanging ambassadors, embassies, flight travel among other things, Saudi Arabia and the US have boosted their aid to Egypt in hopes to buy influence. Just last month, the new Secretary of State John Kerry announced an additional quarter billion in financial aid for Egypt. More importantly, the Egyptian people themselves have been extremely vocal against Iran’s encroachment in Egypt. More radical anti-Iranian sentiments have been captured through the “Shi’ite scare” across Egypt that has been driven mainly by Salafists. Salafist groups have demanded the ban of Shi’ites from entering the famous al-Hussein Mosque, and Shi’ites have been barred from forming political parties. Enemies of Salafists have often been accused of being Shi’ites which have led to their prosecution (by finding an unrelated charge to torment them) or rejection from society. You could say it’s similar to the “Red Scare” in the US under the Eisenhower witch-hunt for Communists. Despite the lack of support to put it mildly, or more appropriately the vast opposition against reconciliation and reconstruction of relations between Egypt and Iran, I believe positive relations between the two states will benefit the Middle-East. President Morsi will be able to more effectively persuade Iran to end support for Bashar al-Assad if he is close with President Ahmadinejad. Considering that Iran’s relationship with Syria is solely a marriage based on convenience, upholding ties with Egypt will be much more important than holding onto the declining leadership in Syria, especially whose fall is inevitable. And for Iran–Well, the Islamic Republic could really use some friends right now. President Morsi, who has been accepted and recognized by the West as Egypt’s rightful leader could play an important role in future nuclear talks between Iran and the West. 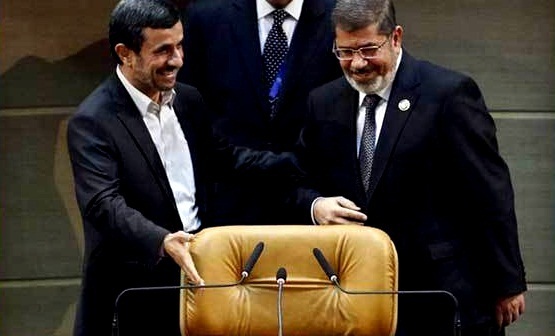 Moving closer to Iran will also prove that Morsi will not be a sell-out to the West, much like his predecessors. Moving closer to Egypt will also be good for Iran to have a spokesman to show support for Iran in the Arab League, against countries like Saudi Arabia who have repeatedly hoped to unite Arab States against Iran. However the new governments elected after the Arab Spring revolutions will need to better reflect the demands of the people. For as long as the Egyptian people oppose any movements toward full-on relations with Iran, Morsi won’t have too much room to maneuver. Relations between Iran and Egypt have been the best they have been seen the Islamic Revolution, where Iranians cut-off ties after Sadat accepted the overthrown Shah in Egypt. The mending of relations between Egypt and Iran is a milestone. It’s unclear though where it will, or can, go from here. ← Banning Wrestling from the 2020 Olympic Games–A Slap in Iran’s Face.